The Eye on Malaysia.Photo from flickr.com by w.Girl. Malaysians are not a particularly creative bunch. Perhaps this is because we are taught to follow and believe blindly – crticisms and even innocent questions are looked upon with great disdain. Ask why certain policies are perpetuated to seeming eternity, and you will be accused of sedition — legally accused, mind you, it’s the LAW. So it’s expected when we just plagiarised an idea from London — the London Eye. And all this talk about wanting to break free from the chains of imperialism. It looks like we are still kow-towing, at least in ideas, to our former colonial masters. And guess what? We celebrate 50 years of ‘independence’ this August. Maybe it’s true, reality is perception. What happens if most are deluded? 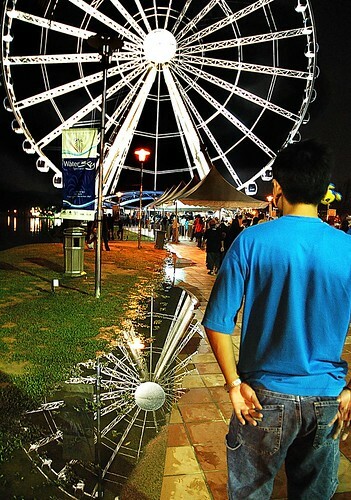 For more on the Malaysian copycat version of the London Eye, read an earlier post by plonkwork here.